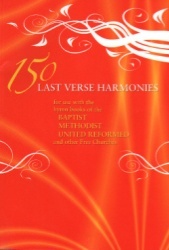 150 Last Verse Harmonies is a collection of hymn tunes commonly found in the hymn books of the Baptist, Methodist, United Reformed Church and other Free Churches. The original tune and harmony is given first, some tunes in more than one key to reflect the variety of keys found in different hymn books, followed by a last verse treatment by one of our composers. We hope that those who use this collection and their congregation will enjoy discovering or reacquainting themselves with this rich vein of hymnody.